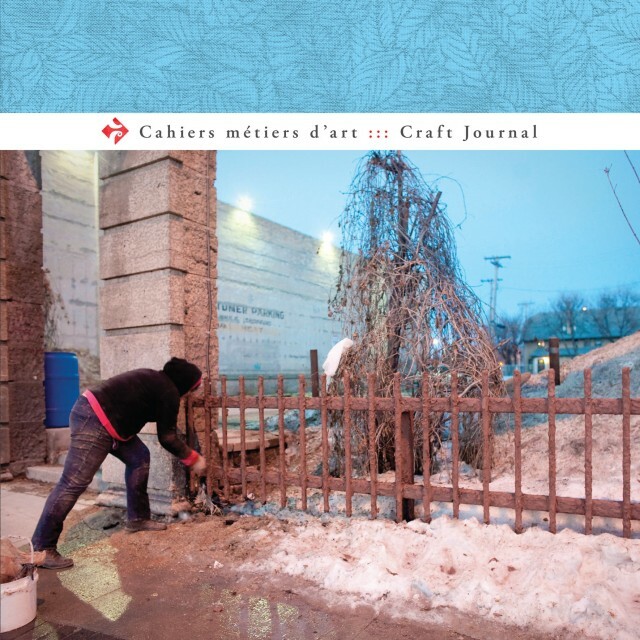 I had the honour of guest co-editing the latest issue of Cahiers métiers d’art / Craft Journal with Mireille Perron from the Alberta College of Art and Design. Thank you to Mireille Perron for being wonderful to work with and to my colleague Elizabeth Roy and my two former students for their participation. And a big thank you to the magazine editor Denis Longchamps, his editorial board, and all the volunteers for their tireless dedication to making this magazine happen. Bravo to all! Grace Nickel, Assistant Professor at the School of Art, University of Manitoba, was guest co-editor, with Mireille Perron from the Alberta College of Art and Design, of the latest issue of Cahiers métiers d’art / Craft Journal. This is Canada’s only peer-reviewed magazine that encourages and publishes critical, historical, and technical research on local and international craft. Nickel and Perron established the Question of Material and Labour as the theme of this issue. Nickel also authored an essay for the magazine titled “A Conversation on Making and Teaching in a Post-Disciplinary Time.” The article examines some of the questions surrounding material- and discipline-based making, and the tradition of labour-intensive practice and teaching in a post-disciplinary climate in the early part of the 21st century. For her article she interviewed her University of Manitoba colleague Elizabeth Roy, Assistant Professor in the School of Art, and two recent MFA graduates from the University of Manitoba, Monica Mercedes Martinez and Lindsay Joy. Monica appears on the cover, performing her piece Softening the Line, 2014. The electronic version of Cahiers métiers d’art / Craft Journal, vol. 7, no. 2, is available through the University of Manitoba Library.